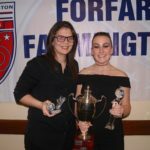 Four goals from Ashleigh Smith helped Forfar Farmington Ladies recover from last week’s defeat with a 6-3 victory over Hutchison Vale Development. Despite going behind, three Smith goals put Forfar ahead however Vale pulled the game level again before Smith’s fourth and a Carrie Hoggan double gave Jeff Rioch’s side all three points. Credit should also be given to 15 year old Oliwia Gach after she made her senior debut for the side, stepping up from U15 level with an impressive performance. It was an entertaining game at Market Muir which saw both teams create and miss chances in the opening fifteen minutes. Hutchie Vale took the lead after a great initial save from Gach; the loose ball was knocked back past her with the forward reacting quicker than the defence. Forfar were guilty of missing a couple of one on one chances but good work from Hoggan on the left wing saw her pass find Smith and the striker fired into an empty net to level the scores just before half time. Farmington came out brightly in the second half and went ahead with two well taken goals from Smith to complete her hat-trick. Rather than allowing Vale to keep their momentum going, the Ladies dusted themselves down and got back on the front foot instead of feeling sorry for themselves. 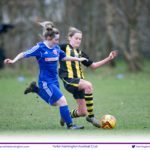 Great wing play and determination saw Emily Younger put Carrie Hoggan through on goal and the winger calmly fired home with her left foot. Smith grabbed her fourth to cap off an impressive game for her after great pressing from midfield before Hoggan netted her second with two minutes left; latching on to a Harley pass before finishing. All in all it was a deserved result and the desire to go on and claim all three points after being pegged back at 3-3 was great to see. 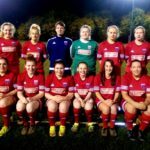 The result brings the Ladies up to fifth in the SWFL2 East Division and they face a trip to Seton Ladies in a fortnight as they look to continue their good start to the season. 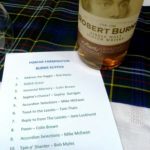 Great night was had by all on Friday to celebrate Robert Burns, many attending their first burns supper. Many thanks to the speakers and entertainers for the evening, and to those who helped on the night. 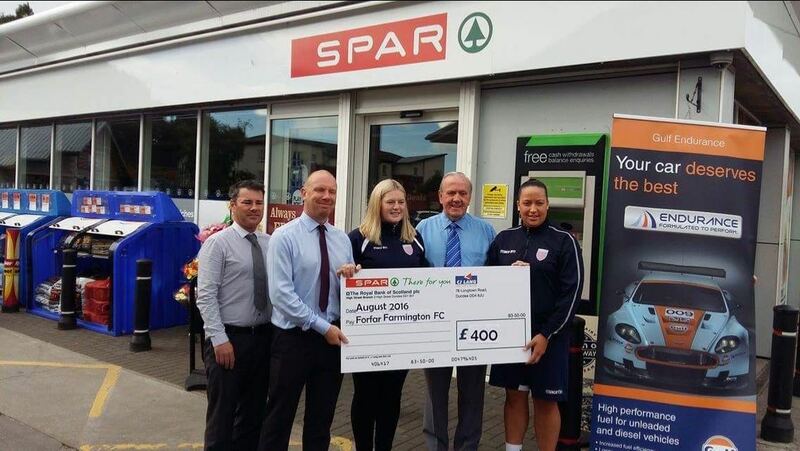 A fantastic £450 was raised, to go towards the ladies new tracksuits. 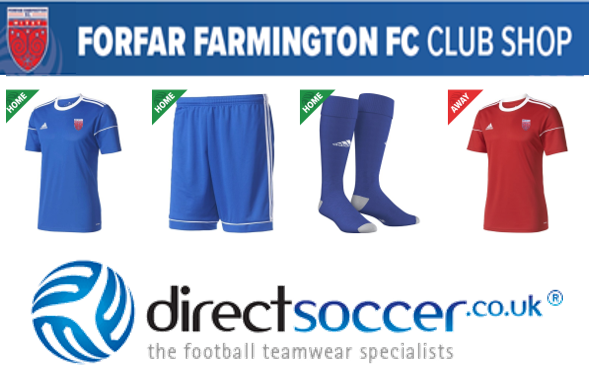 Forfar Farmington Ladies team would like to thank SPAR, Academy Street, Forfar for their kind support in sponsoring their new blue (home) kit for next season. The girls were delighted to show off the kit prior to their penultimate league game of this season last Sunday. If you would like to be part of this squad next season please contact coach Jeff Rioch for more information. McIntosh of Strathmore Donate New Kit to Ladies. 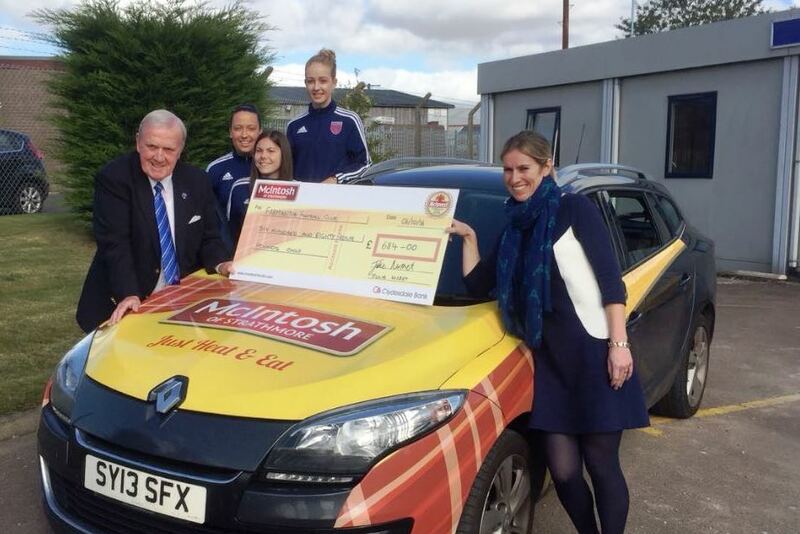 McIntosh of Strathmore become the latest Sponsor of Forfar Farmington Ladies Team. Their kind donation of a new is a great asset to the team. Chairman Colin Brown would like to thank McIntosh of Strathmore for supporting the club with a new kit. We wish them every success in business here in Forfar. I hope we can carry the Company name with pride to the various parts of the Country. New faces for Ladies as they look ahead. 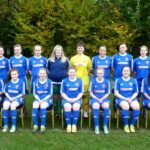 The Farmington Ladies team have had a busy few weeks with a number of new faces coming onboard as they build for next season. 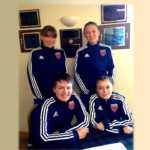 Ladies coach Jeff Rioch commented, ” We’re delighted to have all 4 players sign up to supplement the existing numbers. It’s been a difficult 18 months for the team with no regular coach and I’ve been looking to bring in players to support the girls who’ve been regulars over that period. I’m very keen to get away from the “recreational” tag that this team has and whilst it’s not all about winning, the girls have really bought into where we want to get to. 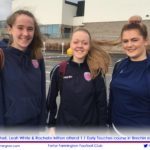 It’s a young squad who are all keen to do well – training nights are increasing, attendance is good, fitness is getting better and performances have undoubtedly improved on the back of their continued commitment. I’ve known about Emily’s qualities for some time since she played u13s at Monifieth. She brings good pace and an eye for goal to the squad and she has showed up really well in our recent friendly and the last two league matches, scoring in all three, despite several months away from the game. Lou first came to my attention a couple of years back and I’ve been impressed every time I’ve seen her since. Her distribution, handling and shot stopping is excellent. When she became available a few weeks ago it was a no brainer for me to try and get her in to add competition for the goalkeeping spot and again she has acquitted herself very well in the games so far. Pictured back are Cat & Monika welcoming Lou & Emily to the squad having put pen to paper in the last week.